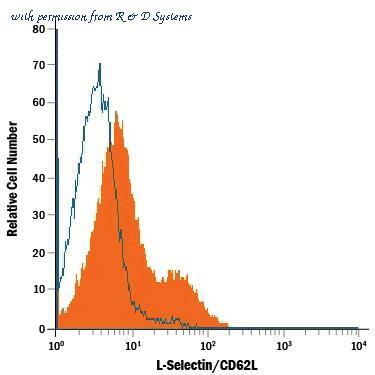 Detection of L-Selectin/CD62L in Mouse Splenocytes by Flow Cytometry. 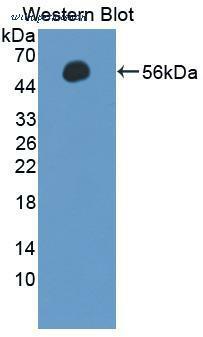 Mouse splenocytes were stained with Rat Anti-Mouse L-Selectin/CD62L Fluorescein-conjugated Monoclonal Antibody (Catalog # FAB5761F, filled histogram) or isotype control antibody (Catalog # IC006F, open histogram). View our protocol for Staining Membrane-associated Proteins . Figure A. FITC conjugated rat anti mouse CD3 ( MCA500F ) and RPE conjugated rat IgG2a isotype control ( MCA1212PE ). Figure B. FITC conjugated rat anti mouse CD3 ( MCA500F ) and RPE conjugated rat anti mouse CD62L ( MCA1259PE ). All experiments performed on red cell lysed mouse blood gated on lymphocytes in the presence of mouse seroblock ( BUF041B ). Data acquired on the ZE5 Cell Analyzer. Western blot of SELL / L-Selectin / CD62L antibody. 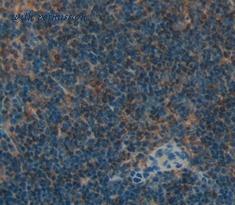 Immunohistochemical analysis of paraffin-embedded rabbit soft tissue using CD62L antibody . Immunohistochemical analysis of paraffin-embedded rabbit muscle using CD62L antibody . 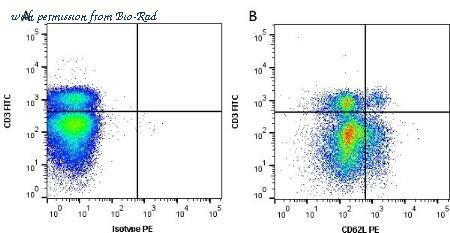 Flow cytometric analysis of Mouse spleen cell using CD62L antibody. Flow cytometric analysis of CD62L expression on spleen lymphocytes. BALB/c splenocytes were treated with Mouse BD Fc Block™ purified anti-CD16/CD32 mAb 2.4G2 (Cat. No. 553141) and stained with FITC-conjugated anti-Mouse CD62L(50045-R414-F). 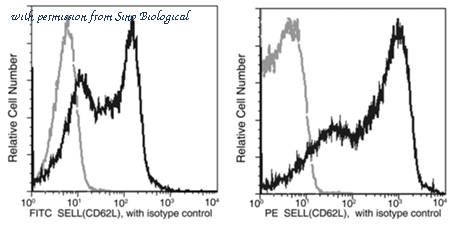 The histogram were derived from the gated events based on light scattering characteristics of lymphocytes. Flow cytometric analysis of CD62L expression on spleen lymphocytes.